or pathogenic particles in the air you are breathing. The AllergencoD sampling cassette was developed for the sampling and collection of aeroallergens and bio aerosols for quantitative analysis of mold spores, pollen, skin fragments, insects, combustion particles, toners, environmental dusts, construction dusts and other airborne particulates. The AllergencoD employs a patented laminar flow venturi which provides higher readable collection efficiency as well as a more well defined impaction trace, helping to reduce analysis time. 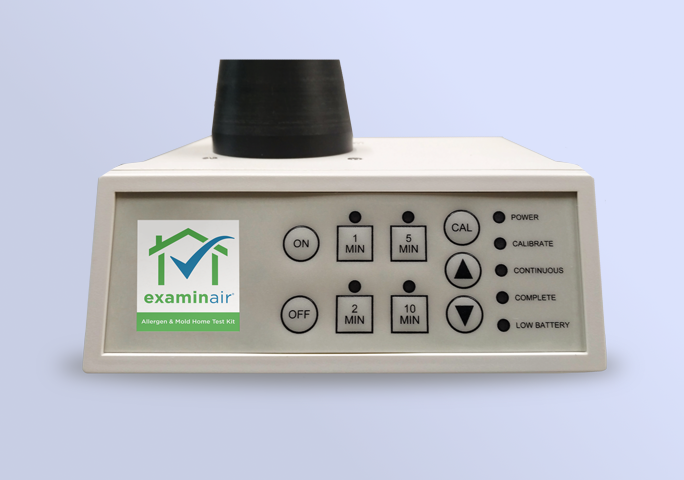 using the ExaminAir Home Mold Test Kit. (directions for determining locations included with pump). 2. Attach cassette to pump. 3. Push start button on pump. Pump will pull air sample and automatically shut off at the end of the cycle. 4. Repeat process for each sample location. 5. Place pump and cassettes in pre-paid, self-mailing box and ship at the nearest Fed-Ex location. 6. Results will be sent to you via fax, e-mail or US Post Office, which ever you selected in documentation.